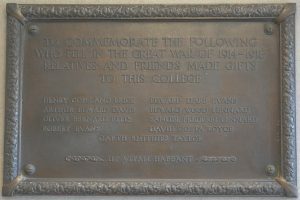 15 October 2016 marks the 100th anniversary of the death in action of Lieutenant Garth Smithies Taylor, a name which many staff and students at the University will have unwittingly passed on numerous occasions when entering the Fielding Johnson Building. 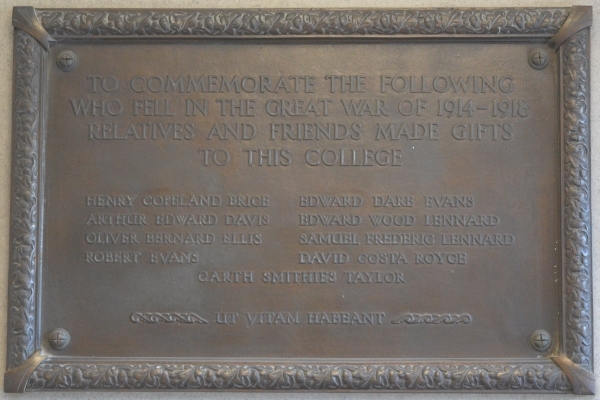 The following account of Taylor’s life, death and significance to the University was researched and written by Elizabeth Blood, PhD student in the School of History, Politics and International Relations working on the creation of local war memorials in Leicestershire during and immediately following World War One. Additional information provided by Simon Dixon. Records in the University Archives record a number of donations towards the founding of the University College made in memory of nine young men who were killed in the conflict. The names of those soldiers are inscribed on a memorial tablet at the entrance to the Fielding Johnson Building on the University campus. This building, originally the County Asylum, had been used as a military hospital during the war. It is named after Thomas Fielding Johnson, a local hosiery manufacturer who bought the former hospital site and donated it to the people of Leicester, Leicestershire and Rutland for educational use. Among those remembered on the tablet is Garth Smithies Taylor, who was killed in action on 15 October 1916 at the age of just 20. The above photograph of Taylor is taken from the Memorial Portraits book (ULA HIS/FOU/2, Memorial Portraits), a volume of photographs and brief biographies of prominent donors and those they wished to remember. It records that Lieutenant Taylor was in the 2nd Battalion Nottinghamshire & Derbyshire Regiment (the Sherwood Foresters) at the time that he was killed. Most of what we know about his life, however, comes from other sources. These include Michael Doyle’s published Their Name Liveth For Evermore: The Great War Roll of Honour for Leicestershire and Rutland and Leicestershire County Council’s War Memorials Project. Further details of his life are contained in a privately printed book recently gifted to the University Library [SCM 13852: Garth Smithies Taylor (Reading, 1971)]. This contains copies of letters, diary extracts and family photographs published by Taylor’s sister Dorothea in 1971, and provides some additional information about his upbringing. 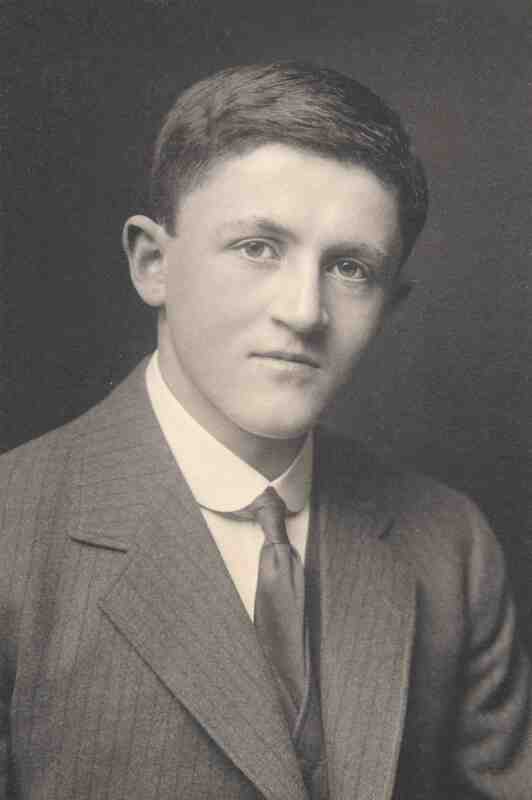 Garth Smithies Taylor was born on 27th June 1896 in Kibworth Harcourt to parents Thomas Smithies Taylor and Mary Ellen (Nellie) Taylor (nee Bennett). He attended Stoneygate School in Leicester, then Bedales School, Petersfield, followed by Nottingham High School. His university education was in accounting at the London School of Economics. After studying he went to Heidelberg to learn German and then to Berlin to a firm of camera and lens makers, with a view to entering the family business in Leicester (his father was a scientific instrument maker). His mother appears to have been an active suffragette. She refused to fill her entry in the 1911 census, writing “No vote no census” on the return. Her father, and Garth’s grandfather, had been John Bennet, an affluent corn merchant and once Lord Mayor and Alderman of the City of Leicester. Her brother, Frederick William Bennett, entered the medical profession and went on to spend most of his career at the Leicester Royal Infirmary, where he was the hospital’s first Consulting Aural Surgeon. He had a keen interest in Geology, because of which the Bennett Building was named after him in 1965. Garth Smithies Taylor was 18 when the War broke out, and like a lot of other very young men, he enlisted. He appears to have begun as a Civilian Clerk at the Main Supply Depot, Northampton, with the Royal Army Service Corps (R.A.S.C.) and was made a 2nd Lieutenant in February 1915. Following this he was a Lieutenant in the Horse Transport of the R.A.S.C. by October 1915. He was sent to France in December 1915, and whilst there transferred at his own request to the 2nd Battalion Sherwood Foresters in April 1916. His name is recorded on the Thiepval Memorial on the Somme, the largest memorial to the missing. He is also named on memorials at the University of Leicester, Nottingham High School and on a Boy Scouts Association memorial currently housed in All Saints’ Church, Leicester. Garth Smithies Taylor, who died aged 20, 100 years ago this month, had enjoyed a better education than some of his peers, but his life was cut all-too short by the First World War. All of us who work and study here should reflect that the University we are so familiar with is a tribute to Garth Taylor and his generation. We can all remember this when we see the University’s motto Ut Vitam Habeant means “That they may have life”: life that so many of their predecessors were denied.